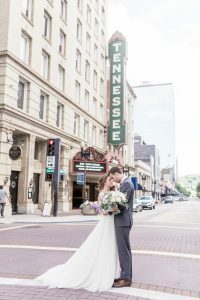 What a beautiful East Tennessee wedding for Hayden and Emily at the beautiful and elegant Historic Southern Railway Station. For the couple that loves a bit of history and is enchanted by the beautiful historic building, this should be on your bucket list. Everything last detail was planned to a tee by All About Weddings-Knoxville, TN. The couple’s memories were captured in video by Sweet Tea Productions. The sounds of the ceremony, the celebration and the fun was provided by Ogle Entertainment and Light Design. Chuck O’Connor of Sensational Ceremonies worked with Hayden and Emily to deliver the custom ceremony of their dreams. Rich in love and laughter; just the way they wanted it. OH SNAP Photo Booth Knoxville was on site to allow the guests to capture their memories in a creative way. With costumes and props they could dress up in all sorts of ways. The bride’s beautiful fresh floral bouquet was made by Wade Floral Company. It was absolutely stunning. Every moment from getting ready to the exit after the reception was was documented by the wonderful photographer Juicebeats Photography.